Almost a year ago (July), I did my homework/research to find the best, not just a better layout than qwerty (that's easy), I was lucky to get it right first time with Colemak mod dh wide. 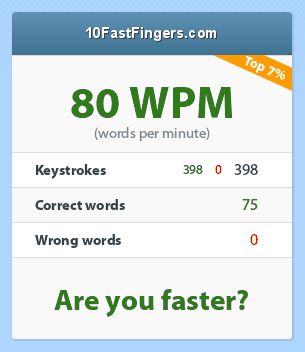 my typing speed improved almost naturally. here's a result for a typing test I did on the 20th. How did I forget to thank DreymaR and Stevep99..
and I use their AHK scripts for the extend layer and KLC file (I modified) for the layout. Glad you're happy with your layout! You seem to have started a little before me, and going for the same layout as well ;) Great choices :p I'm really content as well, I actually feel it the most when I'm typing on a laptop keyboard, it's by no means feeling as cramped anymore, and just that's a great win for the times that I have to use the laptop keyboard. My best is also around 80, so have reached about the same speed as me.